At Burns & Wilcox our expertise becomes your expertise. Our marketing materials are designed to help you give your clients what they want to hear – yes to almost any hard-to-place-risk. Approximately 12.9 percent of residences, more than 17 million housing units, were vacant in 20151—many of which sit unprotected today. 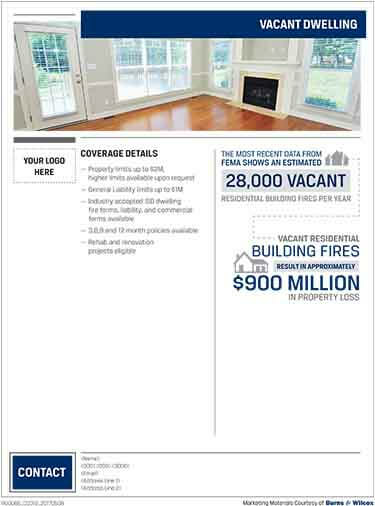 The window of opportunity for retail brokers and agents to speak to clients about Vacant Dwelling insurance is wide open. This is not a headline your clients want to see. But the fact is, there are an estimated 25,000 vacant residential building fires reported each year, resulting in $777 million in property loss. Placing vacant properties, short-term rentals and similar nonstandard risks requires the kind of flexibility that is possible only through successful relationships with the excess and surplus market. “If you’re a personal insurance broker or agent, you might not be familiar with working with the excess and surplus market. If you’re a commercial broker or agent, you may not be aware that four-family or smaller rentals can be written on dwelling fire or modified homeowners forms,” says Donna Dodd of Burns & Wilcox. Even in good times, policy exclusions can test a relationship with a client. In tougher times, unforeseen exclusions can wreak havoc on an insured’s business and impede their ability to repair property damage, pay medical fees or adequately protect their assets. Here Amanda N. Ruppel, Personal Insurance Manager, Burns & Wilcox and Melanie M. Elias, Corporate Associate Vice-President, Director of Claims, Minuteman Adjusters, examine several scenarios to highlight best practices and some common pitfalls in the policy creation process in order to help brokers and agents keep their clients on-track. That upheaval has changed circumstances and lifestyles, sometimes profoundly. And the insurance industry — especially the excess and surplus (E&S) market — is responding by providing or tweaking coverage to meet the shifting needs of its customers. Dwelling fire policies are a case in point.